Social worker’s four-year drive to prove that laughter truly is the best medicine has finally brought her international recognition. Dr Gita Suraj-Narayan, 56, and her daughter Sheroma, 26, from South Africa, received the IBN Tilmeez award for the best healthcare management research study at the combined 7th Annual Pan-Arab Critical Care Medicine Congress, 3rd Asia-Africa, World Federation of Societies of Intensive and Critical Care Medicine Conference and 7th Emirates Critical Care Conference in Dubai in April. They researched the benefits of laughter therapy for stroke victims. Their work has impressed the members of the social welfare department at Ryukoku University Junior College in Japan so much that they intend to use their techniques of laughter-yoga to help people deal with the shock of the recent earthquakes in Japan. This entry was posted in Laughter News and tagged benefits of laughter, critical care medicine, dr gita, great strides, laughter therapy, laughter yoga, medicine conference, medicine congress, more than three decades, recent earthquakes in japan, ryukoku university, singing the praises, social welfare department, stroke survivors, stroke victims, therapy sessions, yoga classes, yoga group on June 11, 2011 by Sebastien Gendry. Aim of the research: To investigate the effects of laughter therapy on depression, cognitive function, quality of life, and sleep of the elderly in a community. 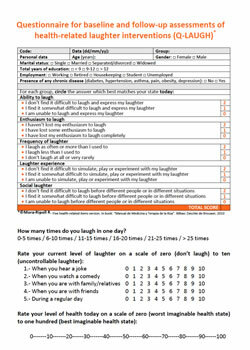 Methods: Between July and September 2007, the total study sample consisted of 109 subjects aged over 65 divided into two groups; 48 subjects in the laughter therapy group and 61 subjects in the control group. The subjects in the laughter therapy group underwent laughter therapy four times over 1 month. We compared Geriatric Depression Scale (GDS), Mini-Mental State Examination (MMSE), Short-Form Health Survey-36 (SF-36), Insomnia Severity Index (ISI) and Pittsburgh Sleep Quality Index (PSQI) between the two groups before and after laughter therapy. Conclusion: Laughter therapy is considered to be useful, cost-effective and easily accessible intervention that has positive effects on depression, insomnia, and sleep quality in the elderly. This entry was posted in Laughter Research and tagged effects of laughter, laughter therapy on January 26, 2011 by Sebastien Gendry. An hour of weekly laughter was good enough for Jung-Oak Lee, 64, to fight off depression that coincided with two years of chemotherapy to treat her colon cancer. Every Friday afternoon, she travels almost two hours to join about 100 other cancer patients and families in a packed hallway of Seoul National University Hospital, one of Korea’s largest, to learn how to guffaw. This entry was posted in Laughter News and tagged brain and body, cancer patients, colon cancer, effects of laughter, laughter therapy, laughter yoga, mental depression, serotonin on January 26, 2011 by Sebastien Gendry. 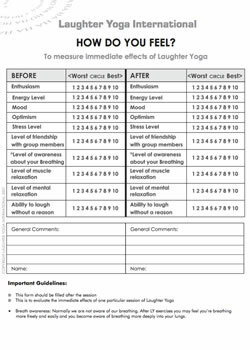 The first scientific study (randomized controlled trial) to provide evidence for the efficacy of Laughter Yoga in mental disorders was published this month in the International Journal of Geriatric Psychiatry. Findings showed that Laughter Yoga matched the efficacy of exercise therapy and even proved superior in improving life satisfaction. This entry was posted in Laughter News, Laughter Research and tagged evidence based research, laughter therapy, laughter yoga on October 2, 2010 by Sebastien Gendry. Whitney Munro did not think that as a fitness specialist and mother she had to take a class just to learn how to laugh. But she signed up for laughter yoga class and second-guessed herself all the way to the American School of Laughter Yoga in Chicago. Two days later, she returned home exhilarated, eager and certified to teach laughter therapy to the seniors she helps at Fairview senior living community in Downers Grove, Illinois. This entry was posted in Laughter News and tagged fitness lab, fitness specialist, laughter therapy, laughter yoga, lightening the load, madan kataria, tickle me elmo doll, yoga class on April 5, 2010 by Sebastien Gendry.